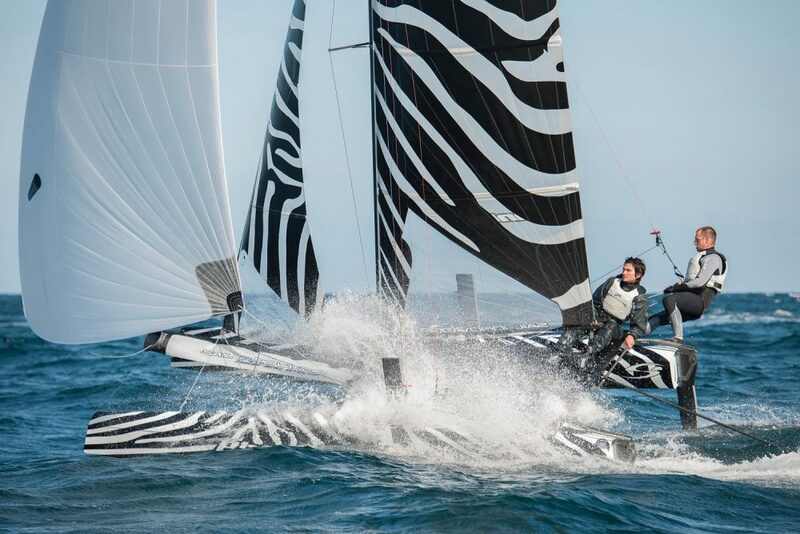 This summer two new mind-blowing performance catamarans—both 35-footers—are hitting the water with a need for speed. 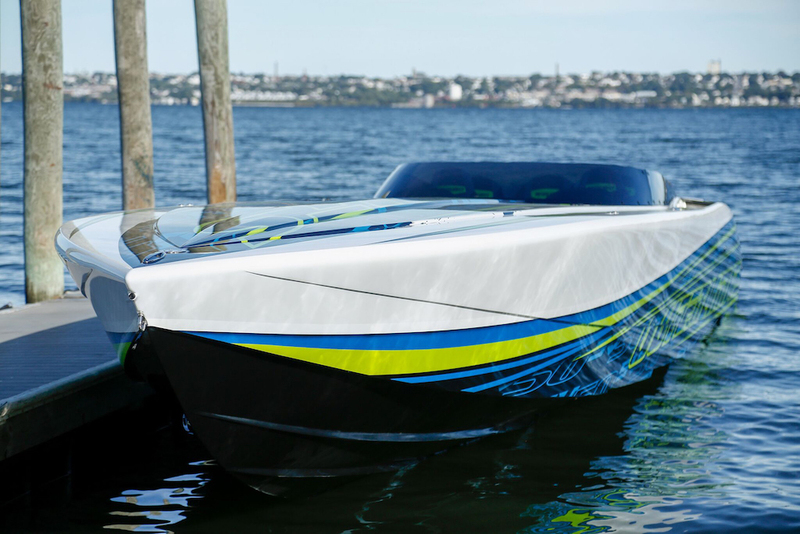 While DCB Performance Boats of El Cajon, Calif, builds custom high-performance catamarans from 26 to 44 feet long, two models at opposite ends of the power spectrum are its hottest sellers. 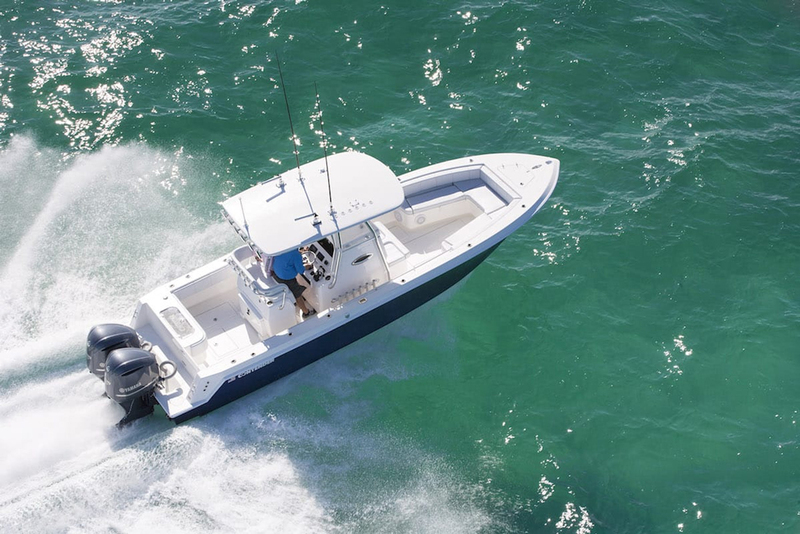 On the outboard engine side, there’s the M28R, a 28-footer equipped with twin Mercury Racing Verado 400s. On the stern-drive side, there’s the M35, which can be powered with Mercury Racing inboard engines from 860 to 1,550 HP. With all the buzz surrounding—and not going anywhere anytime soon—outboard-powered sport cats, DCB has been busy filling orders for the M28R, which thanks to the simplicity of outboard engine installation and rigging has a shorter build time than its 35-foot stern-drive sibling. But that doesn’t mean M35 sales and production has slumped, as witnessed by two new exquisite models that have hit the water so far this summer. DCB’s Tony Chiaramonte plans to run Shawn Gibson’s M35 in the Lake of the Ozarks Shootout at the end of the month. In late June, the company’s Tony Chiaramonte delivered an M35 called Top Secret to Oklahoma-based Shawn Gibson. Powered by dual-calibration Mercury Racing 1550/1350 engine, the cat is Gibson’s second DCB 35-footer with power-adjustable engines. 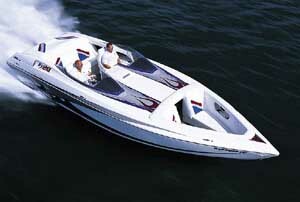 However, this time around he ordered the boat with a switchable, dual-fuel four-tank fuel system. 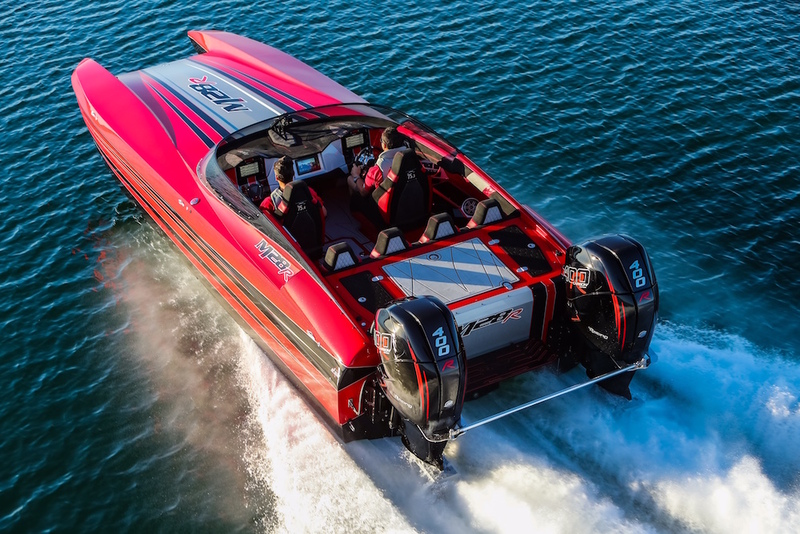 The boat has two tanks, one for the 112-octane fuel required for running in the engines in 1,550 HP model and another for the 91-octance fuel required for running them in 1,350 HP mode, on each side. “The guys at DCB outdid themselves,” said Gibson. “We lightened it up quite a bit—I think they took 600 to 800 pounds out of it—and we changed up a lot of things, like the fuel tanks, on it. We got the new dash with the larger GPS screens, and we tricked out the (all-Alcantara) interior on. And the engine compartment is tricked out to the max. Adrenaline did the trailer, and there’s nothing like it out there. We’re excited about it. A lot of time and a lot of communication went into this one." Less powerful but equally stunning, DCB delivered another new M35 catamaran to Stephen and Kelly Marino in Alabama. Like Gibson, they had previously owned a DCB offering, but theirs was an M28R sport catamaran. That boat was a stepping stone to their new 35-footer, which is powered by twin Mercury Racing 1100 engines. The half-capped, vacuum-infused 35-footer was built carbon fiber stiffeners and balsa coring and color-matched to its custom-built, galvanized Adrenaline triple-axle trailer with FUEL Krank wheels and LED lighting. The El Cajon, Calif., custom boat company's Carlos Lafarga and company finished the boat’s interior with a combination of Alcantara—the primary material used—and Marine Ultra Leather. The upholstery work was accented with a custom CNC stitch pattern. The Marinos will display their new M35 catamaran at Super Cat Fest, which runs concurrently with the Lake of the Ozarks Shootout. As for features in its six-person cockpit, the Marino’s M35 is positively loaded. Electronics include a pair of Simrad NSS9 Evo3 monitors flanking a Garmin 7612 in center of the carbon fiber dash and a Garmin VIRB camera recording system secured a to CNC-machined strut mount. The boat’s RacerX intercom headset communication system for all passenger includes an isolated “DCB Channel” on VHF for boat-to-boat communication, and its Phase III stereo system boasts JL Audio coaxial speakers and subwoofers—with Focal amplifiers—and a Fusion head unit with remote control. The owners also opted for DCB’s Rigid LED lighting package, which includes interior lights, mood lights, tunnel lights and LED cupholders, as well as SeaDek flooring for the cockpit sole. The Marinos named the 35-footer Twin Ladies for their four-year-old twins.